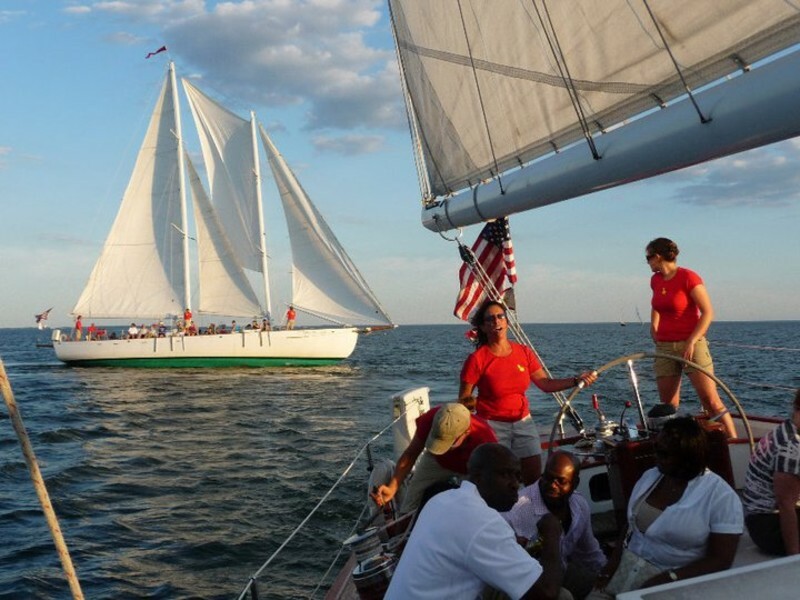 Sail the Chesapeake on a 74-foot schooner! Raise the sails, steer the boat, or sit back and relax on a two-hour sail. Special, longer event cruises, too. 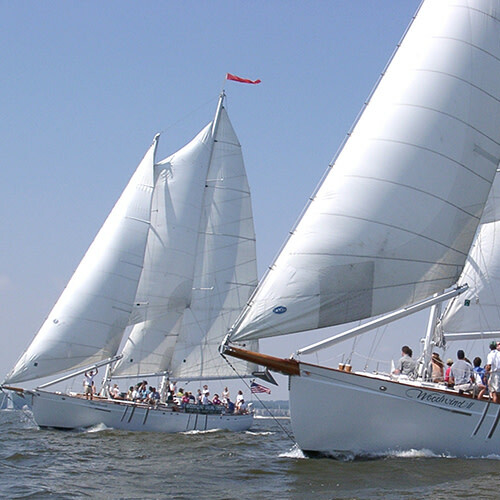 The Woodwind and Woodwind II offer a real Chesapeake sailing experience for public sails and private events. Buy a ticket, or privately rent the entire boat. 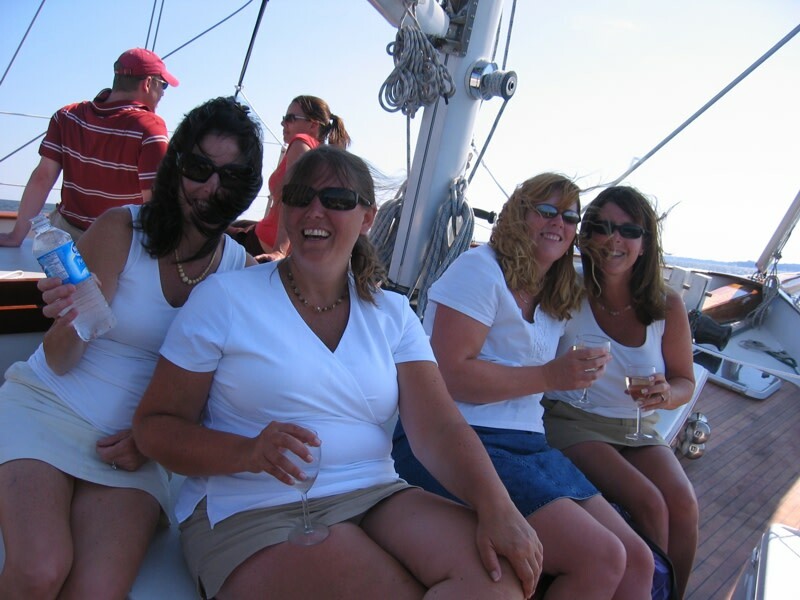 Fun, team match racing, corporate outings, crab feasts and catered sunset sails. 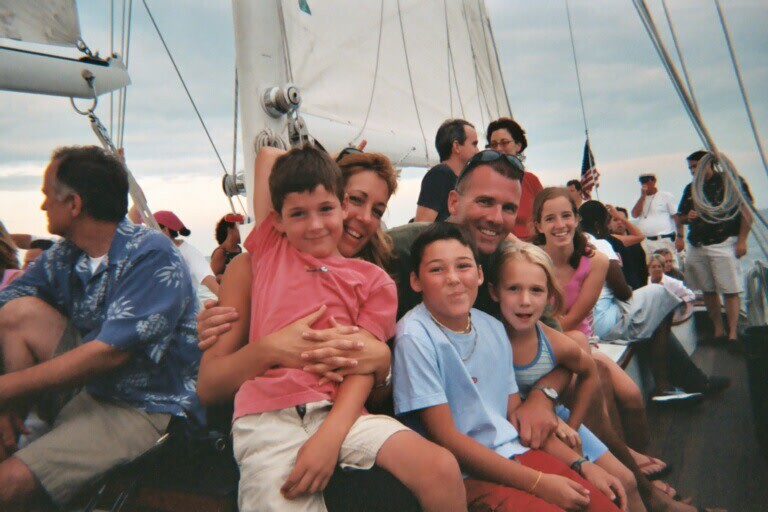 Sailing is a great way to celebrate birthdays, reunions, and a wedding weekend. Departs from the downtown, Annapolis Waterfront Hotel. 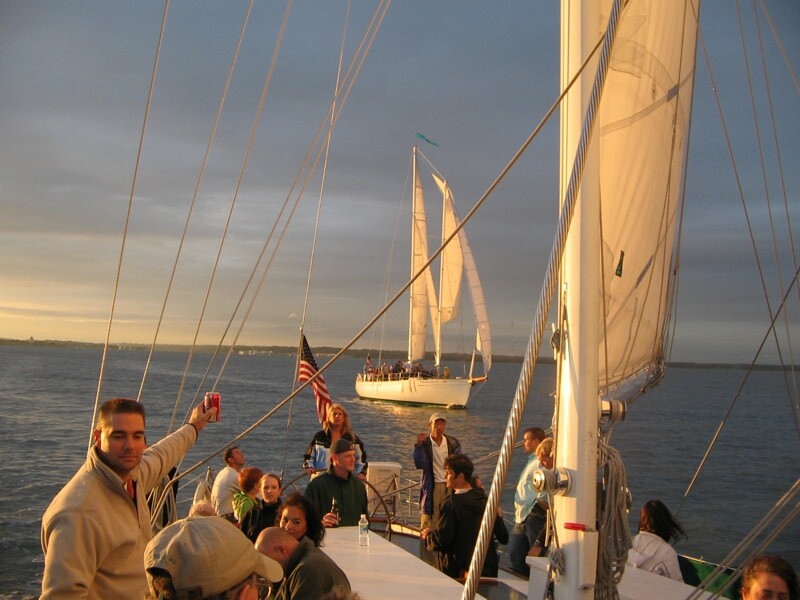 Help raise the sails, steer the boat or just sit back and relax aboard the Schooner Woodwind. For the month of October, weekday cruises require a 12 person minimum and one day's notice, but no minimums on weekend cruises. Sail times are 12:30-2:30 & 3:00-5:00 and all cruises depart from the Annapolis Waterfront Hotel. Tickets are $48 for adults and $31 for children under 12 years and include a soft drink/bottle of water, snack, and tax. Beer and wine are available for purchase during the cruise. Sit back and relax as Roadside Show entertain you while sailing on the Chesapeake Bay. The cruise departs from the Annapolis Waterfront Hotel dock at 5:30 p.m. and returns 7:30 p.m. Tickets are $48 for adults and $31 for children under 12 years and include a soft drink/bottle of water, snack, and tax. Beer and wine are available for purchase during the cruise. Enjoy learning about Annapolis with Kevin Brooks. When you set sail from downtown Annapolis, you see the gorgeous historic skyline that has welcomed ships in for centuries. We sail past the United States Naval Academy and into the Chesapeake Bay. Come listen to the stories that make up the fabric of history in this terrific town. Topics change weekly. Cruises depart from the Annapolis Waterfront Hotel Dock at 5:30 pm and return at 7:30 pm. Sail includes soft drink or bottled water and snack. Beer & wine are available for purchase. Sit back and relax as Deanna Dove entertains you while sailing on the Chesapeake Bay. The cruise departs from the Annapolis Waterfront Hotel dock at 5:30 p.m. and returns 7:30 p.m. Tickets are $48 for adults and $31 for children under 12 years and include a soft drink/bottle of water, snack, and tax. Beer and wine are available for purchase during the cruise. Enjoy learning about Annapolis with Jeff Holland. 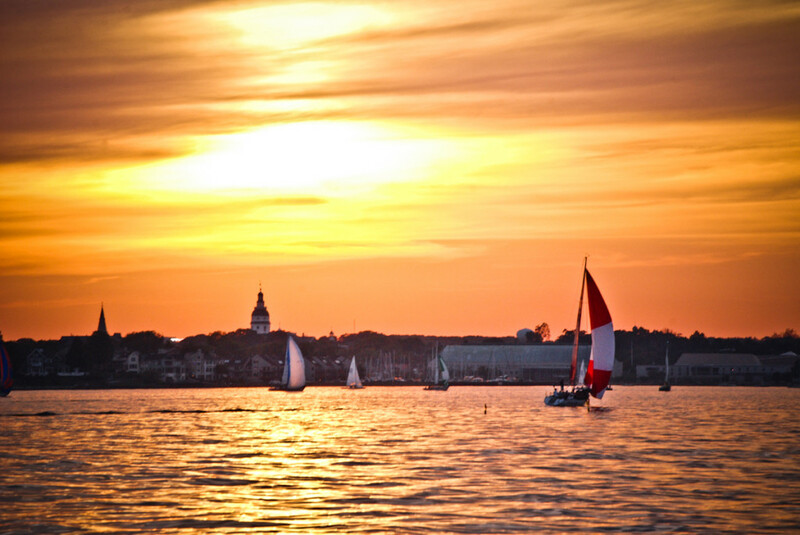 When you set sail from downtown Annapolis, you see the gorgeous historic skyline that has welcomed ships in for centuries. We sail past the United States Naval Academy and into the Chesapeake Bay. Come listen to the stories that make up the fabric of history in this terrific town. Topics change weekly. Cruises depart from the Annapolis Waterfront Hotel Dock at 5:30 pm and return at 7:30 pm. Sail includes soft drink or bottled water and snack. Beer & wine are available for purchase. Enjoy learning about Annapolis with Michael John William. When you set sail from downtown Annapolis, you see the gorgeous historic skyline that has welcomed ships in for centuries. We sail past the United States Naval Academy and into the Chesapeake Bay. Come listen to the stories that make up the fabric of history in this terrific town. Topics change weekly. Cruises depart from the Annapolis Waterfront Hotel Dock at 5:30 pm and return at 7:30 pm. Sail includes soft drink or bottled water and snack. Beer & wine are available for purchase. 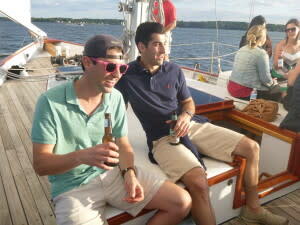 Sit back and relax as the Eastport Oyster Boys entertain you while sailing on the Chesapeake Bay. The cruise departs from the Annapolis Waterfront Hotel dock at 6:30 p.m. and returns 8:30 p.m. Tickets are $48 for adults and $31 for children under 12 years and include a soft drink/bottle of water, snack, and tax. Beer and wine are available for purchase during the cruise. Sample while you sail! 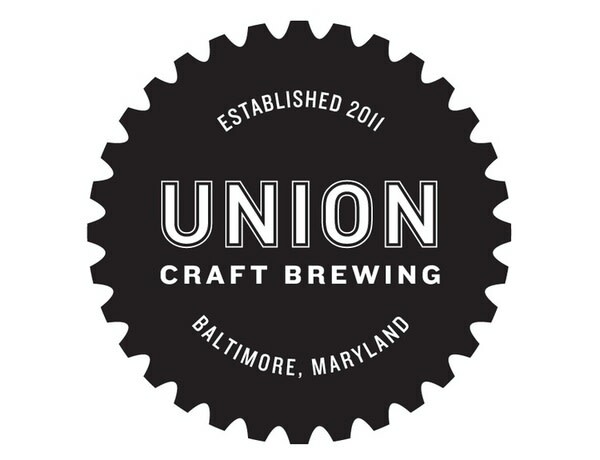 A representative from Union Craft Brewing in Baltimore, MD comes aboard and teaches you about their beer. 3 samples of beer come with the cruise and then order full beers from the brews that you enjoyed the most. 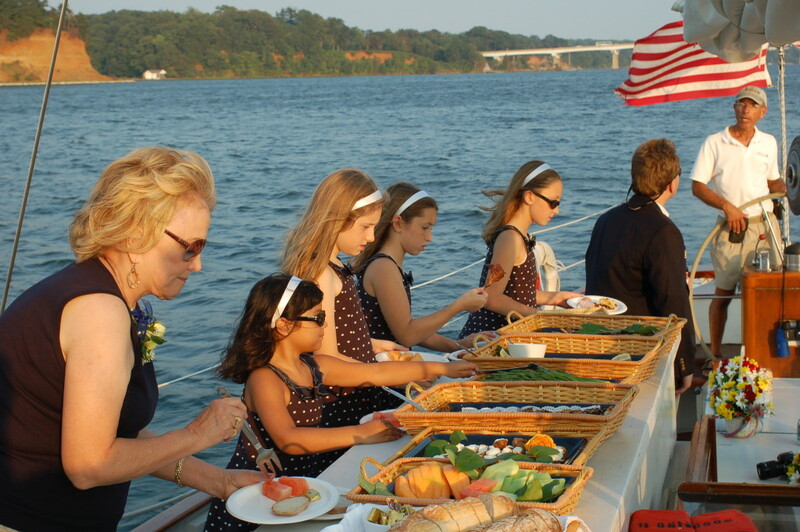 Cruise departs from the Annapolis Waterfront Hotel Dock at 5:30 pm and returns at 7:30 pm. Sail includes a soft drink or bottled water and snack. Beer & wine are available for purchase. 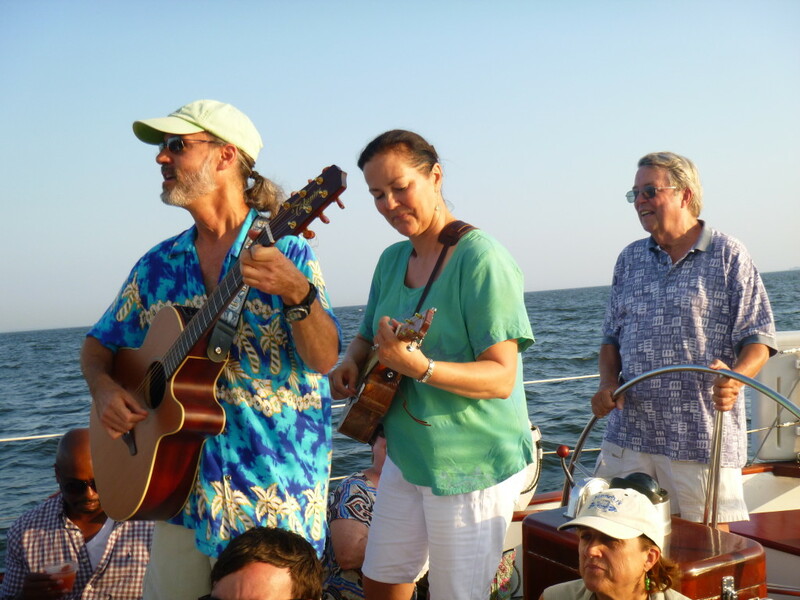 Sit back and relax as Ken Wenzel entertains you while sailing on the Chesapeake Bay. The cruise departs from the Annapolis Waterfront Hotel dock at 6:30 p.m. and returns 8:30 p.m. Tickets are $48 for adults and $31 for children under 12 years and include a soft drink/bottle of water, snack, and tax. Beer and wine are available for purchase during the cruise. 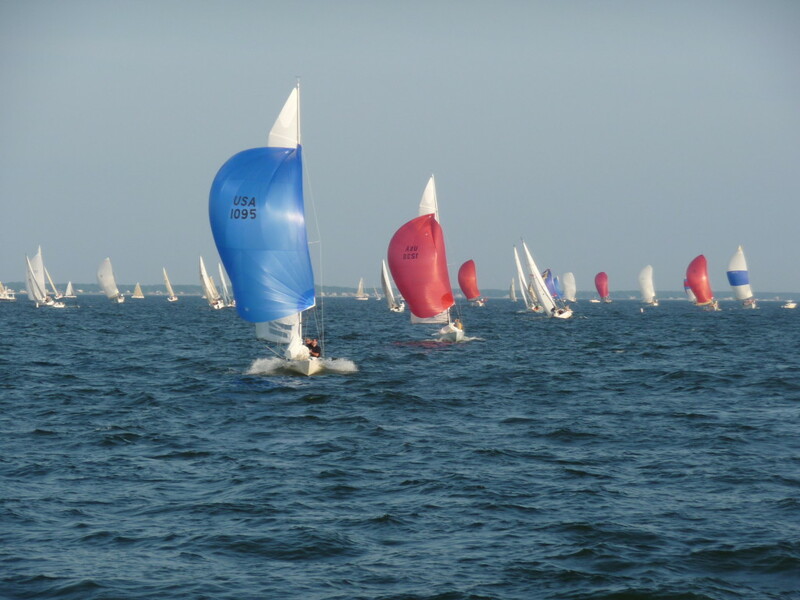 Woodwind and Woodwind II will be match racing every Wednesday night that there is an Annapolis Yacht Club (AYC) Race. Both boats will start on the AYC starting line at 6:45pm, and then race out to a slightly different race course, probably a little longer. 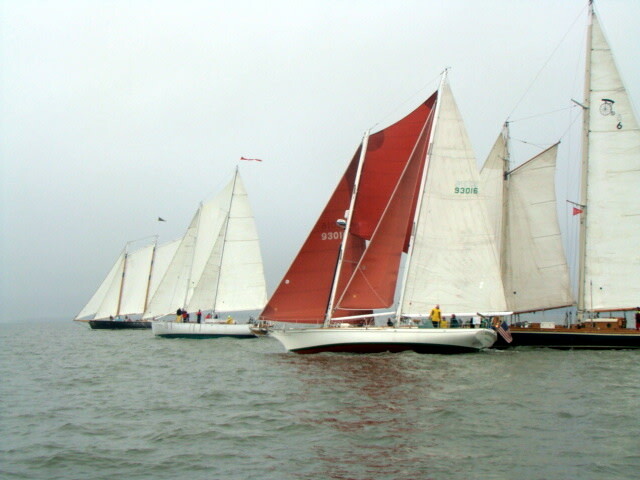 During the race, passengers (guest crew) will be able to participate in helping to sail the boat and steer the boat, when appropriate of course. Sample while you sail! A representative from Port City Brewery in Alexandria, VA comes aboard and teaches you about their beer. 3 samples of beer come with the cruise and then order full beers from the brews that you enjoyed the most. Cruise departs from the Annapolis Waterfront Hotel Dock at 5:30 pm and returns at 7:30 pm. Sail includes a soft drink or bottled water and snack. Beer & wine are available for purchase. 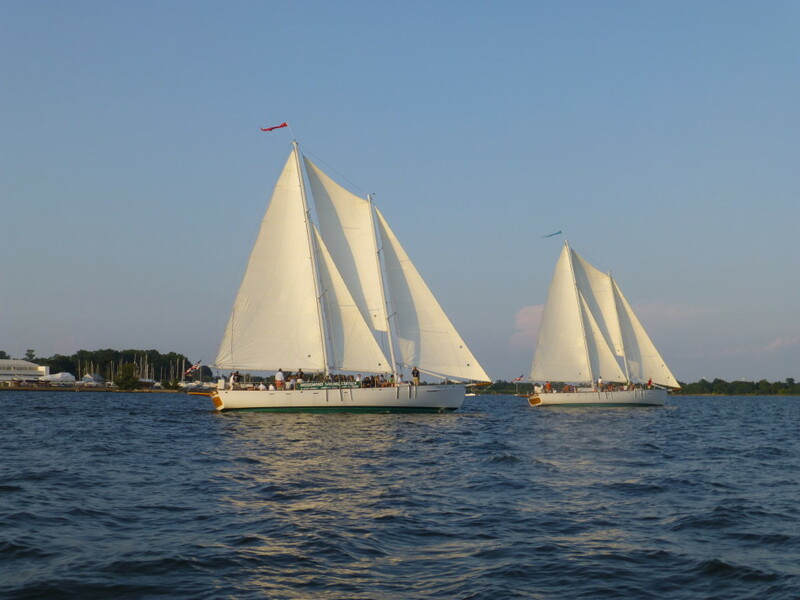 Help raise the sails, steer the boat or just sit back and relax aboard the Schooner Woodwind. Sail times are 12:30-2:30, 3:00-5:00, & 5:30-7:30 and all cruises depart from the Annapolis Waterfront Hotel. View our website to see about our fun Sunset Sails and Specialty Sails. Tickets are $48 for adults and $31 for children under 12 years and include a soft drink/bottle of water, snack, and tax. Beer and wine are available for purchase during the cruise. Enjoy learning about Annapolis with Dave Gendell. When you set sail from downtown Annapolis, you see the gorgeous historic skyline that has welcomed ships in for centuries. We sail past the United States Naval Academy and into the Chesapeake Bay. Come listen to the stories that make up the fabric of history in this terrific town. Topics change weekly. Cruises depart from the Annapolis Waterfront Hotel Dock at 5:30 pm and return at 7:30 pm. Sail includes soft drink or bottled water and snack. Beer & wine are available for purchase. 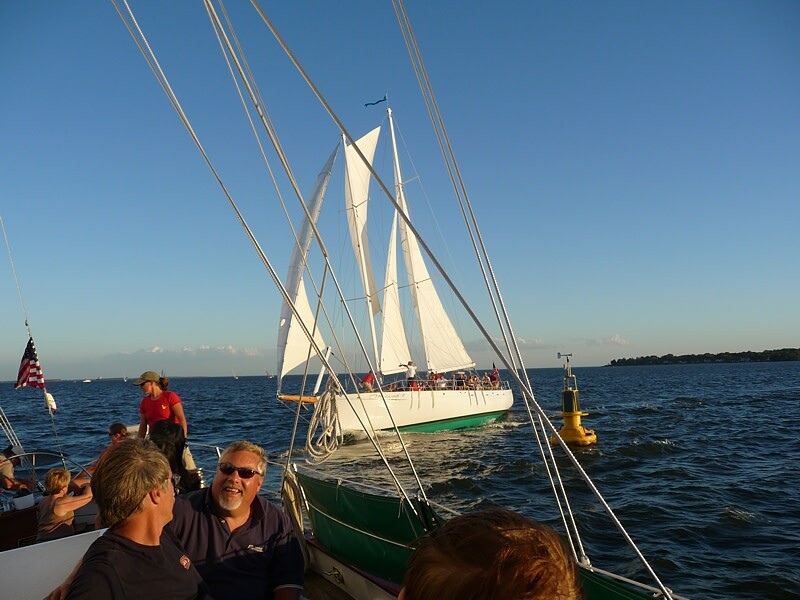 Sit back and relax as Dirk Schwenk entertains you while sailing on the Chesapeake Bay. The cruise departs from the Annapolis Waterfront Hotel dock at 6:30 p.m. and returns 8:30 p.m. Tickets are $48 for adults and $31 for children under 12 years and include a soft drink/bottle of water, snack, and tax. Beer and wine are available for purchase during the cruise. Enjoy learning about Annapolis with Jeff Holland. When you set sail from downtown Annapolis, you see the gorgeous historic skyline that has welcomed ships in for centuries. We sail past the United States Naval Academy and into the Chesapeake Bay. Come listen to the stories that make up the fabric of history in this terrific town. Topics change weekly. Cruises depart from the Annapolis Waterfront Hotel Dock at 6:30 pm and return at 8:30 pm. Sail includes soft drink or bottled water and snack. Beer & wine are available for purchase. 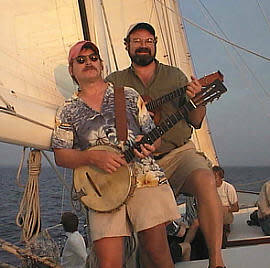 Sit back and relax as Don Shapelle & Don Sennett entertain you while sailing on the Chesapeake Bay. The cruise departs from the Annapolis Waterfront Hotel dock at 6:30 p.m. and returns 8:30 p.m. Tickets are $48 for adults and $31 for children under 12 years and include a soft drink/bottle of water, snack, and tax. Beer and wine are available for purchase during the cruise. Sit back and relax as Deanna Dove entertains you while sailing on the Chesapeake Bay. The cruise departs from the Annapolis Waterfront Hotel dock at 6:30 p.m. and returns 8:30 p.m. Tickets are $48 for adults and $31 for children under 12 years and include a soft drink/bottle of water, snack, and tax. Beer and wine are available for purchase during the cruise. Sample while you sail! A representative from Port City Brewery in Alexandria, VA comes aboard and teaches you about their beer. 3 samples of beer come with the cruise and then order full beers from the brews that you enjoyed the most. Cruise departs from the Annapolis Waterfront Hotel Dock at 6:30 pm and returns at 8:30 pm. Sail includes a soft drink or bottled water and snack. Beer & wine are available for purchase. Sit back and relax as Matt & Katie of Stick Mob entertain you while sailing on the Chesapeake Bay. The cruise departs from the Annapolis Waterfront Hotel dock at 6:30 p.m. and returns 8:30 p.m. Tickets are $48 for adults and $31 for children under 12 years and include a soft drink/bottle of water, snack, and tax. Beer and wine are available for purchase during the cruise. Enjoy learning about Annapolis with Tom Guay. When you set sail from downtown Annapolis, you see the gorgeous historic skyline that has welcomed ships in for centuries. We sail past the United States Naval Academy and into the Chesapeake Bay. Come listen to the stories that make up the fabric of history in this terrific town. Topics change weekly. Cruises depart from the Annapolis Waterfront Hotel Dock at 6:30 pm and return at 8:30 pm. Sail includes soft drink or bottled water and snack. Beer & wine are available for purchase. Join us for a two-hour sail around the Bay to celebrate Bastille Day by sampling wonderful wines from France - A representative will introduce you to several special wines. The cruise will be a relaxing sail including 3-oz samples of each of the four wines featured. Along with each wine is a delicious, perfectly paired bite (we call them magnificent morsels) to go with each wine. Includes a take-home, boat friendly, wine glass by Go Vino with the Woodwinds logo on it. You will be able to raise the sails, steer the boat or just sit back and relax with your wine and food. 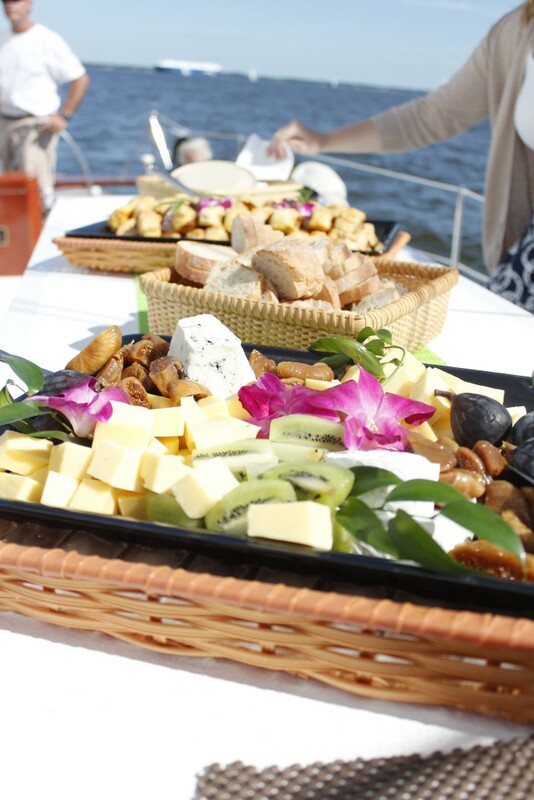 Menu & Wines TBD Cruise departs from the Annapolis Waterfront Hotel at 4:00 pm, returning at 6:00 pm. Tickets are $83 Maximum 40 guests. 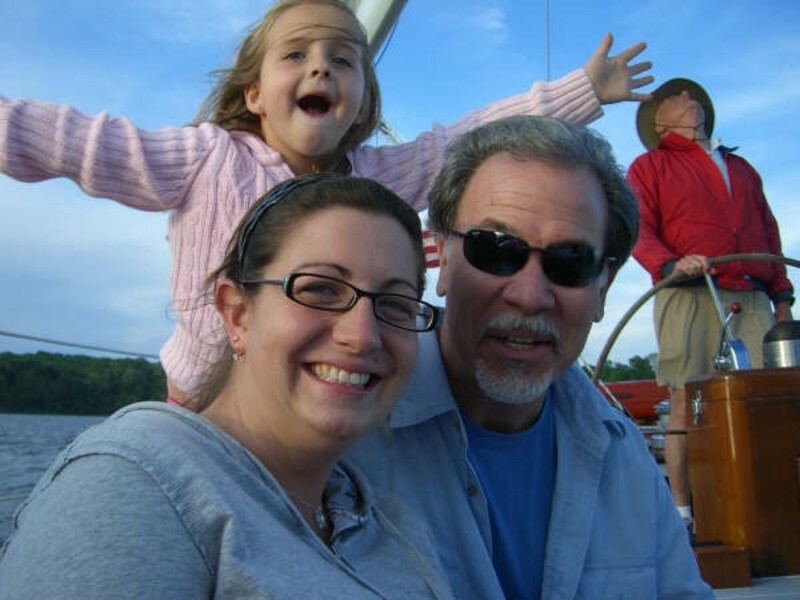 Sit back and relax as Mike & Kelly Lange entertain you while sailing on the Chesapeake Bay. The cruise departs from the Annapolis Waterfront Hotel dock at 6:30 p.m. and returns 8:30 p.m. Tickets are $48 for adults and $31 for children under 12 years and include a soft drink/bottle of water, snack, and tax. Beer and wine are available for purchase during the cruise. 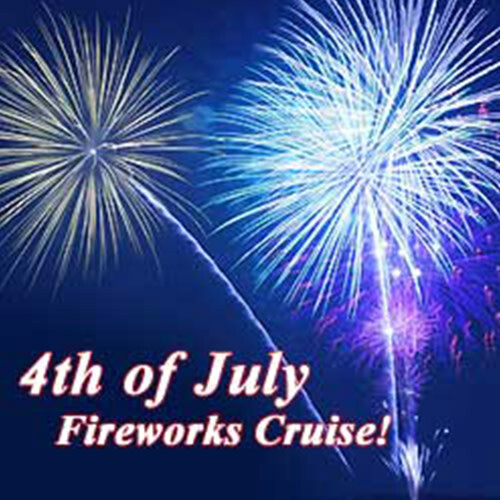 Join us for a festive cruise celebrating the 4th of July. 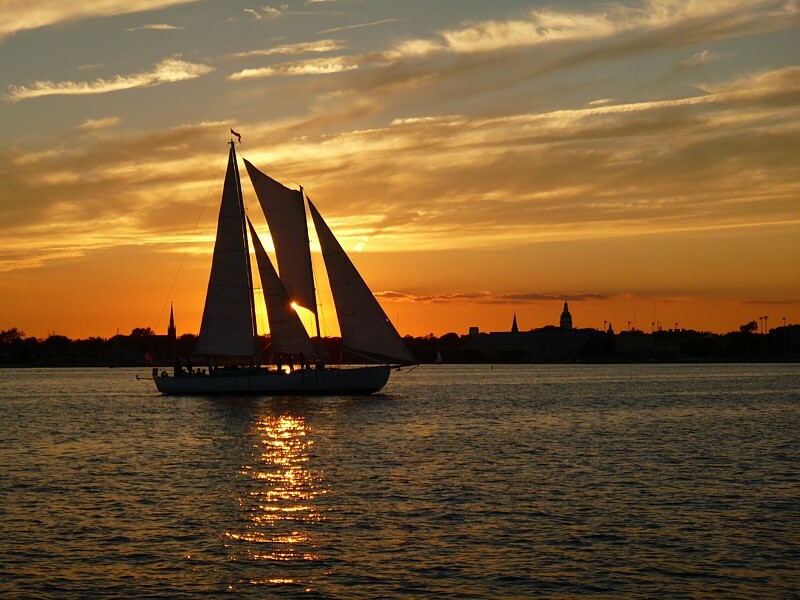 We will depart from the Annapolis Waterfront Hotel dock at 6:30 pm for a sunset sail with live entertainment by Ships Company. We will then anchor close to the fireworks barge for the 9:15 pm fireworks display and return to the dock after the show. Tickets are $93 per adult, $66 per child and include bottled water, soft drinks, and a wide selection of desserts including fresh fruit. Beer and wine will be available for purchase. Maximum 40 guests. Sample while you sail! A representative from Hysteria Brewery in Columbia, MD comes aboard and teaches you about their beer. 3 samples of beer come with the cruise and then order full beers from the brews that you enjoyed the most. Cruise departs from the Annapolis Waterfront Hotel Dock at 6:30 pm and returns at 8:30 pm. Sail includes a soft drink or bottled water and snack. Beer & wine are available for purchase. Enjoy learning about Annapolis with Kevin Brooks. When you set sail from downtown Annapolis, you see the gorgeous historic skyline that has welcomed ships in for centuries. We sail past the United States Naval Academy and into the Chesapeake Bay. Come listen to the stories that make up the fabric of history in this terrific town. Topics change weekly. Cruises depart from the Annapolis Waterfront Hotel Dock at 6:30 pm and return at 8:30 pm. Sail includes soft drink or bottled water and snack. Beer & wine are available for purchase. 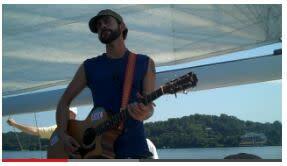 Sit back and relax as Jason Ager entertains you while sailing on the Chesapeake Bay. The cruise departs from the Annapolis Waterfront Hotel dock at 6:30 p.m. and returns 8:30 p.m. Tickets are $48 for adults and $31 for children under 12 years and include a soft drink/bottle of water, snack, and tax. Beer and wine are available for purchase during the cruise. 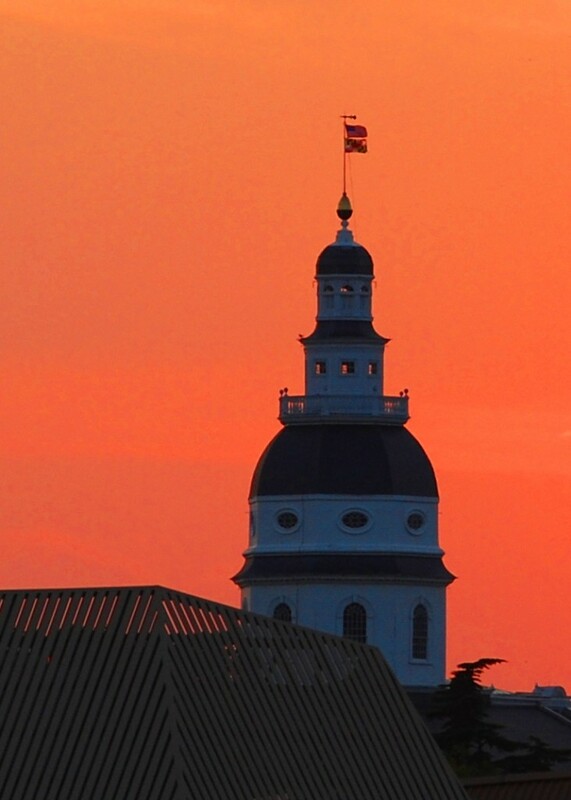 Enjoy learning about Annapolis with Dave Gendell. When you set sail from downtown Annapolis, you see the gorgeous historic skyline that has welcomed ships in for centuries. We sail past the United States Naval Academy and into the Chesapeake Bay. Come listen to the stories that make up the fabric of history in this terrific town. Topics change weekly. Cruises depart from the Annapolis Waterfront Hotel Dock at 6:30 pm and return at 8:30 pm. Sail includes soft drink or bottled water and snack. Beer & wine are available for purchase. 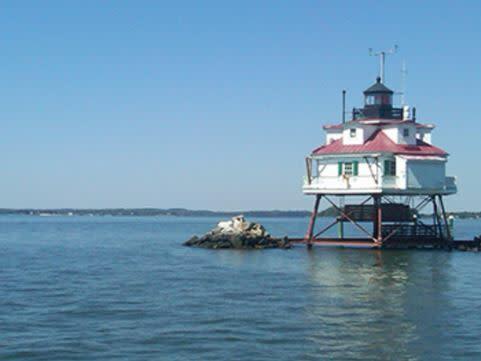 Sail on a lunchtime cruise on the Chesapeake Bay. 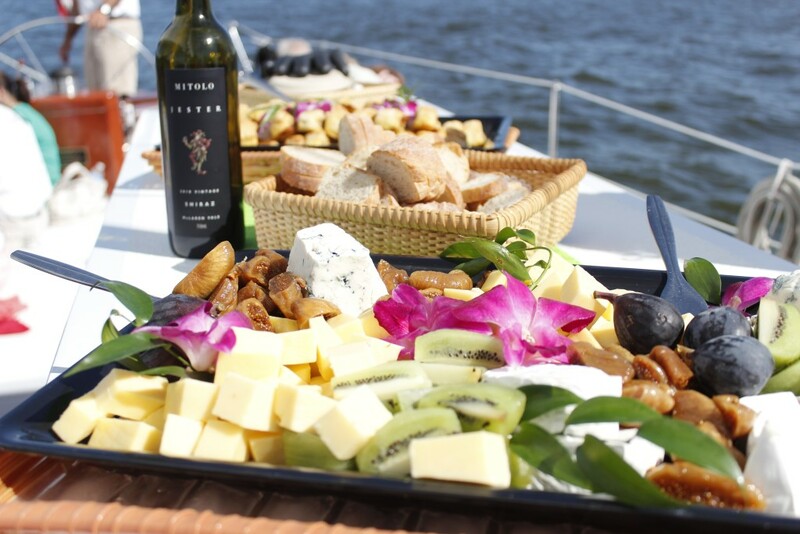 Lunch will be served buffet style while sailing on the beautiful Bay! Tickets are $88 per adult and include lunch, two beers, and unlimited soda and water. Additional beer will be available for purchase. Children under 12 are $51 per person including lunch and soft drinks. Fathers Day Lunch Cruise Menu: Herb Grilled Chicken with tomato coulis Grilled Shrimp with hominy, lime, cilantro, and corn Bistro Slaw: fennel, leeks, crunchy cabbage Power Salad: butternut squash, quinoa, pistachios, curry-maple vinaigrette Mini Brioche Rolls and Butter & Assorted Cookies and Bars Cruise departs from the Annapolis Waterfront Hotel at 1:30 pm, returning at 3:30 pm. Tickets are $88, Children under 12 $51 Maximum 35 guests. This wonderful three-hour brunch cruise includes one free Bloody Mary or Mimosa and delicious food. Menu: Bacon, Ham, Caramelized Onion and Swiss Cheese Quiche Square, Spinach and Tomato Quiche Square, Mini Muffins and Gluten Free Pumpkin Bread, Fruit with Honey Ricotta, Grilled Shrimp with hominy, lime, cilantro and corn, Sliced Hanger Steak with balsamic grilled onions, chimichuri sauce, Mini Brioche Rolls and Butter Cruise departs from the Annapolis Waterfront Hotel at 10:00am, returning at 1:00pm. Tickets are $94/adult and $54/child under 12 yrs. Maximum 40 guests. Enjoy learning about Annapolis with William Ridgely. When you set sail from downtown Annapolis, you see the gorgeous historic skyline that has welcomed ships in for centuries. We sail past the United States Naval Academy and into the Chesapeake Bay. Come listen to the stories that make up the fabric of history in this terrific town. Topics change weekly. Cruises depart from the Annapolis Waterfront Hotel Dock at 6:30 pm and return at 8:30 pm. Sail includes soft drink or bottled water and snack. Beer & wine are available for purchase. 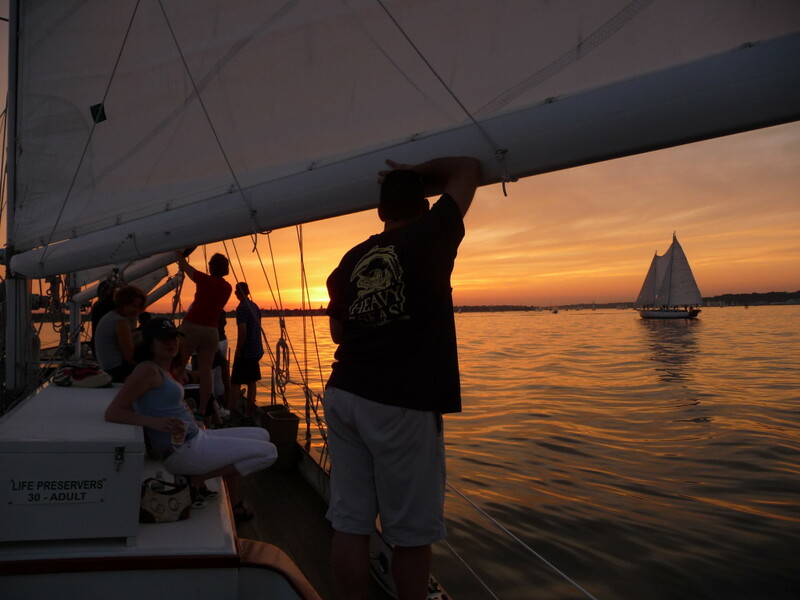 Join us for a two-hour sail around the Chesapeake Bay while sampling wonderful wines. A representative from a winery will introduce you to four special wines while we are under sail. The cruise will be a relaxing sail including 3-oz samples of each of the four wines featured. Along with each wine is a delicious, perfectly paired bite (we call them magnificent morsels) to go with each wine. Includes a take-home, boat friendly, wine glass by Go Vino with the Woodwinds logo on it. You will be able to raise the sails, steer the boat or just sit back and relax with your wine and food. Menu & Wines TBD Cruise departs from the Annapolis Waterfront Hotel at 4:00 pm, returning at 6:00 pm. Tickets are $83 Maximum 40 guests. Sample while you sail! A representative from DC Brau in Washington, DC comes aboard and teaches you about their beer. 3 samples of beer come with the cruise and then order full beers from the brews that you enjoyed the most. Cruise departs from the Annapolis Waterfront Hotel Dock at 6:30 pm and returns at 8:30 pm. Sail includes a soft drink or bottled water and snack. Beer & wine are available for purchase. Enjoy learning about Annapolis with Michael John Williams. When you set sail from downtown Annapolis, you see the gorgeous historic skyline that has welcomed ships in for centuries. We sail past the United States Naval Academy and into the Chesapeake Bay. Come listen to the stories that make up the fabric of history in this terrific town. Topics change weekly. Cruises depart from the Annapolis Waterfront Hotel Dock at 6:30 pm and return at 8:30 pm. Sail includes soft drink or bottled water and snack. Beer & wine are available for purchase. An Intimate, Acoustic Show with Memorial Day favorite, Gareth Asher aboard the Schooner Woodwind for a concert on a beautiful sailing boat, including a light delicious brunch. Gareth Asher returns for an Acoustic Brunch Sail aboard the Schooner Woodwind promoting his new album, Defend the Flame. With lyricism reflecting and celebrating the inner struggles, we face through lifes smiles and tears, Defend the Flame reminds us to accept and release the emotions that can often feel insurmountable within us. This message is one that has no doubt been felt throughout much of his previous music, but with this album, Gareth lays himself bare in a way that he has not shared before. The honesty in the tone of these new and precious songs is one that will leave you feeling more connected to the self and perhaps a little lighter with the knowledge that you are not alone. Gareth has a wonderful way of singing to your soul, says Captain Jen, add that while sailing on the Chesapeake and you have the perfect moments that will turn into favorite memories. Dont miss this show! Enjoy a light brunch as we cruise to a secluded cove. Mimosas and Bloody Marys will be available at our cash bar filled with local craft beer and wine. Menu: Bacon, Ham, Caramelized Onion and Swiss Cheese Quiche Square, Spinach and Tomato Quiche Square, Seasonal Fruit Salad, Pumpkin Bread A maximum of 35 guests will be able to enjoy this really special event! We do sail rain or shine. If the musicians cannot play due to the weather, but we can still sail- we will refund the performance part of the ticket. Cruise departs from the Annapolis Waterfront Hotel at 10:30am and returns at 1:00pm. Adults $89. Sample while you sail! A representative from Flying Dog Brewery in Frederick, MD comes aboard and teaches you about their beer. 3 samples of beer come with the cruise and then order full beers from the brews that you enjoyed the most. Cruise departs from the Annapolis Waterfront Hotel Dock at 6:30 pm and returns at 8:30 pm. Sail includes a soft drink or bottled water and snack. Beer & wine are available for purchase. 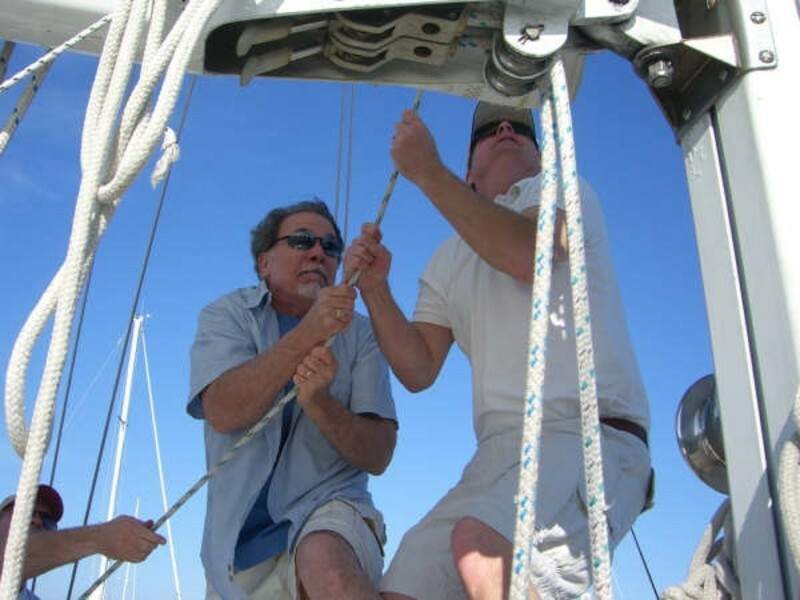 Help raise the sails, steer the boat or just sit back and relax aboard the Schooner Woodwind. Sail times are 11:00-1:00, 1:30-3:30, 4:00-6:00, & 6:30-8:30 and all cruises depart from the Annapolis Waterfront Hotel. 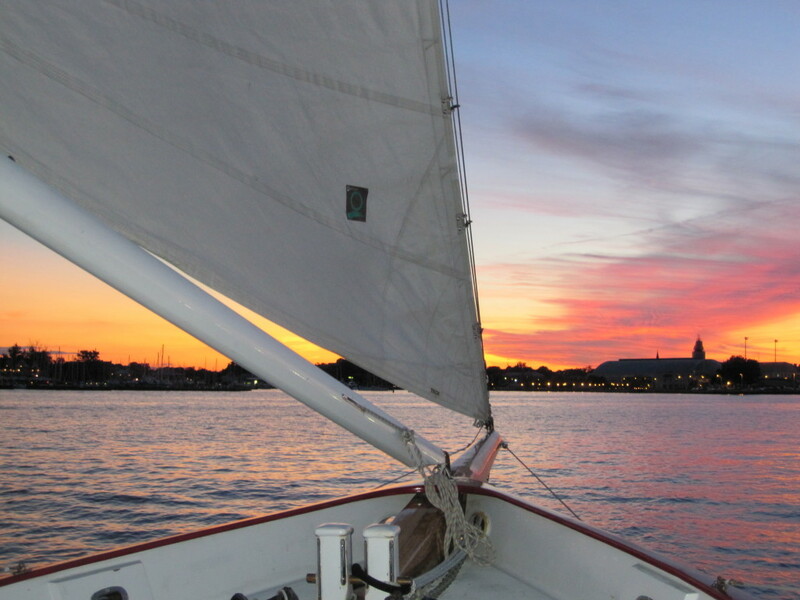 View our website to see about our fun Sunset Sails and Specialty Sails. Tickets are $48 for adults and $31 for children under 12 years and include a soft drink/bottle of water, snack, and tax. Beer and wine are available for purchase during the cruise. 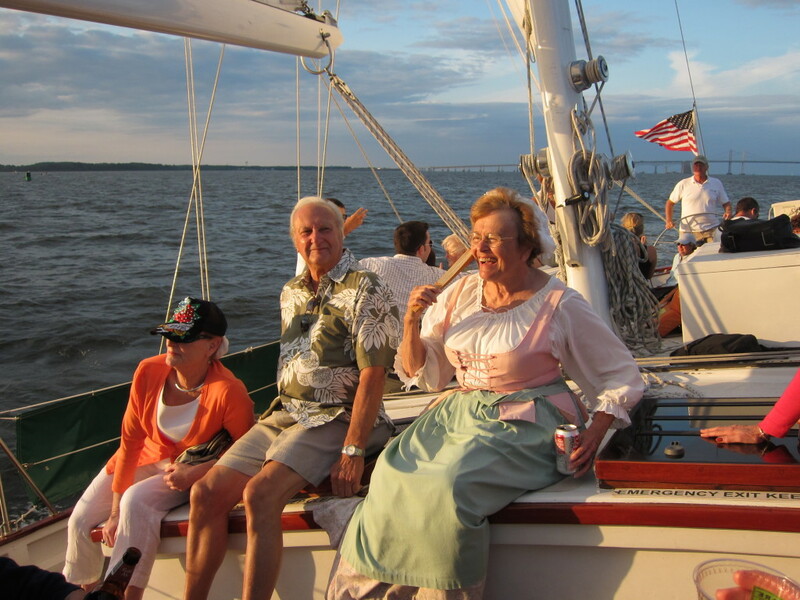 Sit back and relax as Ship's Company entertains you while sailing on the Chesapeake Bay. The cruise departs from the Annapolis Waterfront Hotel dock at 5:30 p.m. and returns 7:30 p.m. Tickets are $48 for adults and $31 for children under 12 years and include a soft drink/bottle of water, snack, and tax. Beer and wine are available for purchase during the cruise. Sample while you sail! A representative from Flying Dog Brewery in Frederick, MD comes aboard and teaches you about their beer. 3 samples of beer come with the cruise, and then order full beers from the brews that you enjoyed the most. Cruise departs from the Annapolis Waterfront Hotel Dock at 5:30 pm and returns at 7:30 pm. Sail includes a soft drink or bottled water and snack. Beer & wine are available for purchase. An Intimate, Acoustic Show with TONY LUCCA aboard the Schooner Woodwind for a concert on a beautiful sailing boat, including a light delicious brunch and a relaxing sail. Tony Lucca is a Nashville-based singer/songwriter whose catalog of music runs the gamut from soul-infused pop to tear-jerker folk balladry. His music has been featured in shows like Parenthood, Friday Night Lights, Felicity, and Brothers and Sisters. He was a frequent member of the house band on Last Call with Carson Daly, where he performed alongside then fellow up-and-comers like Kamasi Washington, Zane Carney, Brian Wright, and stalwarts like Marc Ford and Cordovas frontman, Joe Firstman. In 2012, Lucca took third place on NBCs The Voice, earning himself a record deal with coach Adam Levines 222 Records. He has toured alongside such artists as Sara Bareilles, Jonny Lang, Maroon 5, Kelly Clarkson, Rachael Yamagata, Emerson Hart, and Gabe Dixon. Lucca currently resides in Nashville with his wife, Rachel, their kids Liam and Sparrow, along with their dog Apple. Enjoy a light brunch as we cruise to a secluded cove. Mimosas, Bloody Marys, craft beer, wine and bubbly will be available from our cash bar. A maximum of 35 guests will be able to enjoy this really special event! Cruise departs from the Annapolis Waterfront Hotel at 11:30am and returns at 2:30pm There are no assigned seats. We do sail rain or shine. If the musicians cannot play due to the weather, but we can still sail, we will refund the performance part of the ticket. Tickets are $111 per adults. Sit back and relax as Stefan Heuer entertains you while sailing on the Chesapeake Bay. The cruise departs from the Annapolis Waterfront Hotel dock at 5:30 p.m. and returns 7:30 p.m. Tickets are $48 for adults and $31 for children under 12 years and include a soft drink/bottle of water, snack, and tax. Beer and wine are available for purchase during the cruise. Sail away on one of our first sunset sails of the season. Enjoy great appetizers, cocktails, wine, and beer as you enjoy the scenery of the Chesapeake Bay. The cruise includes appetizers, two drink vouchers, and a sunset sail. Depart Annapolis at 5:30 pm, return at 7:30 pm. Tickets are $78 per adult with a maximum of 35 guests. Cocktail Cruise Menu: Black Bean Hummus Poblano Pimento Cheese Served with pita wedges and crostini Chicken Skewers with roasted veggies and tomato coulis Beef Skewers with roasted veggies and chimichurri sauce Great Assortment of Craft Beers from the Local Area, Wine and a couple of fun cocktails to choose from. 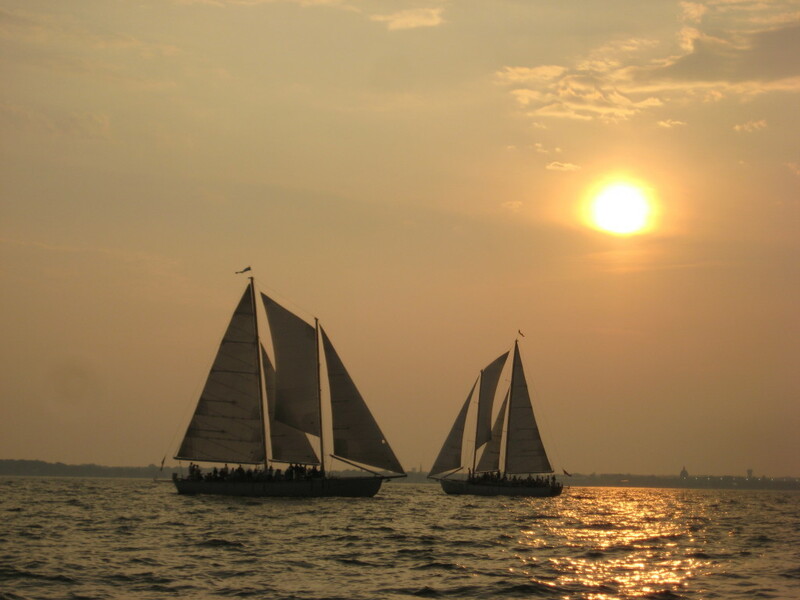 Help raise the sails, steer the boat or just sit back and relax aboard the Schooner Woodwind. Nancy Hammond's "Woodwind" print will be raffled off on each cruise of opening weekend! For the month of April, weekday cruises require a 12 person minimum and one days notice, but no minimums on weekend cruises. 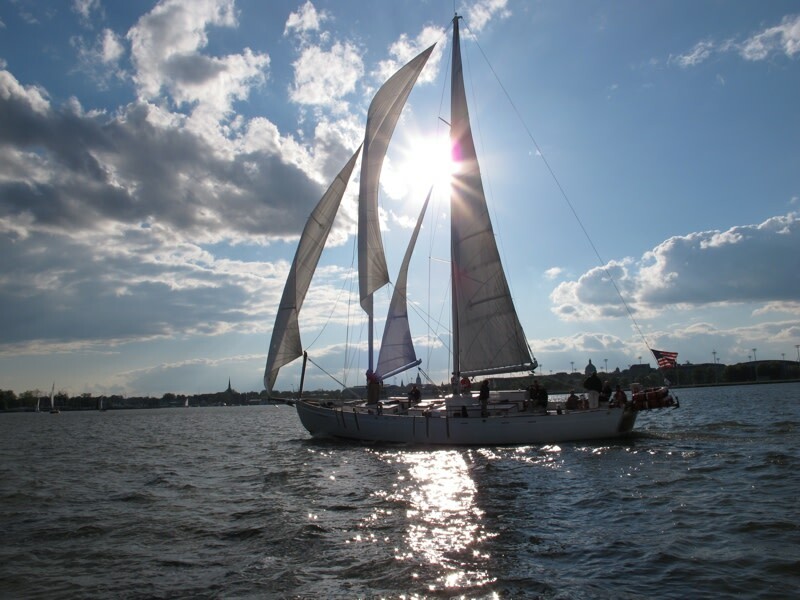 Sail times are 12:30-2:30 & 3:00-5:00 and all cruises depart from the Annapolis Waterfront Hotel. Tickets are $48 for adults and $31 for children under 12 years and include a soft drink/bottle of water, snack, and tax. Beer and wine are available for purchase during the cruise.